With To Kill a Mockingbird, I did what I usually do when I want to read a novel: I did no research at all. I find that going into books without knowing anything about them beforehand is the best way for me to do things. I am able to keep my expectations fairly low, and it also means that I am able to be surprised. I didn’t know what the plot was, and I had only ever heard of one character - Atticus Finch, who I thought was the main protagonist before I started reading, because everyone spoke about him so much. It was a great experience reading this novel from a child’s eyes. Scout grew up over the course of the novel., and it was a pleasure being on the journey with her as she discovered new things and had her eyes opened to the vast world around her. Jem, Scout's older brother, also went through a lot, and we got a small taste of how the events of the novel impacted someone a tad older than Scout. I could go into various other points that I have listed, such as the court trial, Boo Radley, mockingbirds and why it's a sin to shoot them, hypocrisy in the 30's when it came down to race, and so on, but I really do think that you should be able to discover such things for yourselves. Like I said at the beginning, I prefer discovering things on my own, so I want you guys - those of you who haven't read the book - to have the same experience. If you're anything like me then you will cry most of the way through the book. 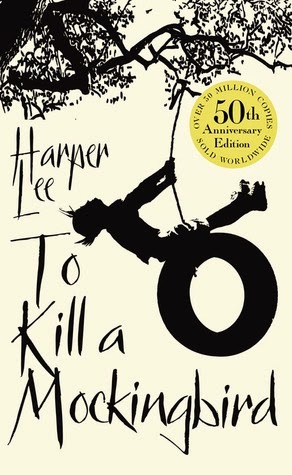 I was a little worried that To Kill a Mockingbird would be hard to get into, which is often the case with me and classics. I needn't have worried, though, because I was sucked in from the very first page. The prose is absolutely beautiful, and you can tell that Harper Lee put everything she had into this novel, which is possibly why she never published another one. I think most established readers would find this to be an easy read, at least when it comes to the writing style. Some of the plot points are quite dark, though the overall message of the novel is a positive one. "Mockingbirds don’t do one thing except make music for us to enjoy. They don’t eat up people’s gardens, don’t nest in corn cribs, they don’t do one thing but sing their hearts out for us. That’s why it’s a sin to kill a mockingbird." To Kill a Mockingbird is an absolute masterpiece, and I will treasure this story and its characters forever. I've been recommending it left, right, and centre, and I've pretty much convinced one of my brothers, who usually only reads for school, to give this a go. To say I'm proud of myself would be an understatement. I agree. A very "readable" classic. I read it for the first time a few years back, and really enjoyed it. I've never read this book, but it's on my list. I'm trying to read more classics and Atticus sounds like a character I need to meet. I really enjoyed reading this in school, I can't exactly remember what year I read it though. It might have been sophomore year. I usually don't like reading classics, but this is definitely at the top of my favorite books! Great review! I am so excited for November you don't even know. Well, you do, since I just told you. But basically, I can't wait to meet Atticus Finch and to read this story which is apparently wonderful and amazing. So... that. "You never really understand a person until you consider things from his point of view... Until you climb inside of his skin and walk around in it." I loooooove this quote. I hate it when people judge other people for no reason, and this is really well-said.